I’ve been a professional musician my entire adult life, mostly as a jazz bassist. As is quite common among bassists, I began having various pains when playing: back pain, particularly, and also shoulder and hand pain. Knowing that dancers deal with a lot of pain in their careers, I asked a dancer friend for suggestions. Actually, I was looking for a referral for “a massage therapist or something.” She did give me the names of some massage people, but also suggested “you might want to check out the Alexander Technique.” I don’t remember learning any more about it before going and checking it out. This was in 1983. What I found was someone who worked with me with a gentle yet clear-intentioned touch. She taught me to use my thinking to allow myself to subtly expand and put less pressure on myself. She gently encouraged me to be less collapsed (I was a serious sloucher! -see the first photo) without being pushy or stiff about it. She taught me to move more freely. I discovered that in applying my Alexander Technique lessons to my playing, and to my sitting, and to my exercising, I stopped hurting my back so much. I also discovered that with my increased physical freedom, I was playing more expressively, swinging more, more alert and energetic. 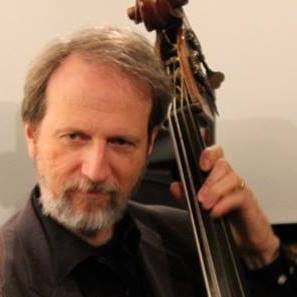 I studied with several excellent bass teachers over my career, but the most help I got for my playing was from an Alexander teacher who didn’t play music at all. I studied with Helen Rea, my first Alexander teacher, regularly for a year, and continued to return for brief periods for the next 15 years. One of the briefest periods of study came in a lesson where I came in because of some problem in my right arm. I set up and played for a few minutes. Helen watched, walked around, and put her hand on my back (“I just wanted to see what was going on there,” she told me afterwards.) I responded to her touch with “Oh!,” and stopped doing some bit of tightening, and the problem went away. I had just needed a little reminder. I reached a point in my life where I wanted to shift from performing toward teaching, and knew that I had to include what I’d learned from Helen. I looked into several options, and the best I found was the apprenticeship program at the Alexander Alliance in Philadelphia. It is a 3-year, 1200-hour program, requiring me to spend two to six days each month there. In May 2001, I was certified to teach the Alexander Technique. As I trained, I came to be inspired by the connection between physical fluidity, mental clarity, and emotional calmness. I’ve been through a real transformation through doing this work. Since completing my training, I teach weekly private lessons and give one-time consultations, depending on individuals’ needs and interest. I’ve been organizing and leading introductory and ongoing classes regularly at my home in Silver Spring. Also, I’ve assisted in introductory workshops at Temple University, Mount Saint Mary’s College, and the Alexander Alliance. I’ve brought my Alexander Technique introductory presentation to the Interservice Vocal Health Day at Ft. Myer, VA, the Southern Maryland Harp Camp and the DC Lute Workshop. I teach weekly private lessons and give one-time consultations, depending on individuals’ needs and interest. I’m active in the Alexander Technique Teachers of Greater Washington (ATTGW) , an organization with the dual mission of informing the public about the Alexander Technique and providing opportunities for teachers to learn and work together. I’ve studied locally with a number of long-term members of ATTGW, principally Meade Andrews , Robin Gilmore, Helen Rea, and Carol Boggs. I’m a teaching member of Alexander Technique International (ATI) , an organization which certifies teachers, sets professional standards, and has ethical guidelines to which I’m committed. I trained at the Alexander Alliance in Philadelphia with Bruce and Martha Fertman (1998-2001). 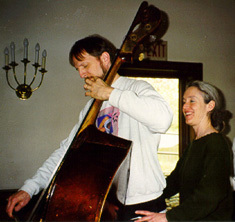 The photo at right is from Philadelphia; my teacher Marty Hjortshoj is helping me apply the Alexander Technique while playing the bass. I also studied at “Alexander Summer Camp” at Sweet Briar , a 2-week summer program for people at all levels of study of the Alexander Technique. A comprehensive set of links, articles and references to information about Alexander resources on the web, compiled by Robert Rickover, can be found at The Complete Guide to the Alexander Technique (www.alexandertechnique.com).